U.S. Chief Acquisition Officer Anne Rung is leaving government after seven years, an Office of Management and Budget official confirmed to FedScoop. 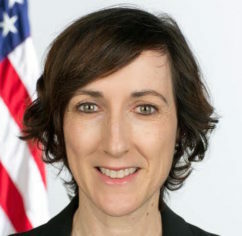 Rung spent the past two years as the administrator of OMB’s Office of Federal Procurement Policy, and before that she served as the General Services Administration’s associate administrator for the Office of Governmentwide Policy and the Commerce Department’s senior director of administration. She will move to Seattle to join the Amazon Business team in a government-facing role as global leader of its public sector division, the company told FedScoop. Her first day will be Nov. 1. Of late, Rung’s biggest achievements center on promoting the governmentwide acquisition push toward category management and smarter spending on IT through centralized contracts. “Anne has been a driving force in implementing the President’s vision for a modern, more efficient, and more effective Government,” OMB Director Shaun Donovan wrote to staff announcing Rung’s departure. “Anne has consistently advanced innovative and effective policies that are making the Federal supply chain more effective, efficient, climate-smart, and socially responsible,” he wrote. Now at Amazon, “her strong leadership and deep knowledge of public sector procurement will help her build upon the progress Amazon Business has made in better serving public sector customers,” said Prentis Wilson, vice president of Amazon Business, the tech giant’s relatively new marketplace line tailored to businesses’ needs. Rung is a two-time honoree on “D.C.’s Top 50 Women in Tech” list, produced annually by FedScoop. Federal News Radio first reported Rung’s departure.